Readers of Martin J's Travel Life will know I have very low regard for United Airlines. They are not my worst airline but close. See my last devastating review of United. I have just flown United 13 times in March and they were scarily impressive. I was wondering how much of this is because of the United Continental merger? United Airlines and Continetal are merging to form the world's biggest airline. The merged airline will be called United. In other words adios Continental name but the planes post merger will carry the Continental colours and logo (see picture from the merger website). A number of my planes were in this logo format on my last trips. United and Continental are continuing to fly separately but clearly lots of "back room" integration is going on. When merged, the airline will serve 371 destinations in 59 countries (although 223 are in the USA). 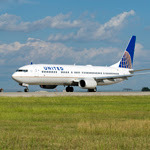 5811 flights depart daily on the two airlines and 144 million people a year fly UnitedContinental. Let me declare, I really like Continental. In July, they were my sixth favourite airline. I wonder which culture will survive the merger. Praying its Continental. The management of the new merged entity are praying they will survive at all in the tough world of aviation. Merging may mean any name survives for a little longer as they compete against the other mega giants. Delta flies 161million passengers a year, Southwest who are taking over AirTran101 million and American 85 million. The question is who will American merge with? USAir? (51million) Alaska- 15m? JetBlue22m? British 32m?